But what about those Critters? Weeds are one thing. You can see them, pull them, and as long as you kill them off as much as possible, and daily pull any that keep popping up, you can keep your garden free of weeds. I went into my garden the other day and found my perfectly smoothed garden beds full of holes. 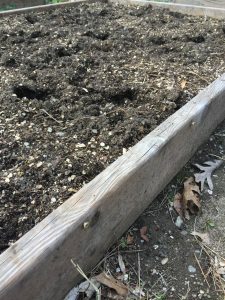 I’ve heard that deer love freshly dug soil and that is what I think was the cause of the damage done to my garden beds. So, I realized that the things we have put into place to keep critters out, the fencing Mark buried under the ground and the six-foot fence, just aren’t enough to do the trick. 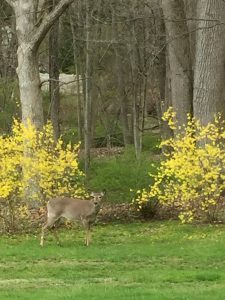 As long as there were weeds growing in the garden beds I couldn’t tell if deer were jumping into my garden or not. As long as I wasn’t working in the garden I saw no evidence of their presence. But as soon as I began to pull the weeds, smooth the soil, and plant seeds; it was then I became aware. That is just like your heart. When you aren’t tending your heart and are living in ways that seem right to you the weeds of neglect are creeping in, making a mess, and are feeding critters you aren’t even aware of. It’s when you begin to get serious about the condition of your heart that you become more aware of all that your heart needs guarding from. That’s when the Holy Spirit opens your eyes to see where you have been wrong, you become convicted of sin, and you begin to pull out the weeds as you confess your sin. That’s when the soil of your heart gets cleared, turned over, and smoothed out. When you get serious about your faith and do the work of guarding your heart, you begin to live a life that produces a great harvest for the kingdom of God! But, you also become a threat to the enemy and he increases his efforts to steal, kill, and destroy! The damage the deer did to the soil of my garden was very discouraging. When I saw the holes their hoofs made and the tiny plants they trampled I wondered whether it was even worth all the effort. It caused me to question whether or not I wanted to keep working in my garden. How important is a good harvest? Is it worth more work? Next Next post: Purpose of the Critter?